… The Old South went from virtual to actual secession only when the addition of non-slave Western states threatened their disproportionate hold on the Congress and the Court (which had been Southern in makeup when ruling on Dred Scott). It is difficult to conjecture what will happen if the modern virtual seceders do not get their way. Their anti-government rhetoric is reaching new intensity. Some would clearly rather ruin than be ruled by a “foreign-born Muslim.” What will the Republicans who are not fanatics, only cowards, do in that case? They know that the filibuster and the gerrymander have already let them politically secede and yet still rule this country. They know they are still ruling because they see government shutdowns structured to protect conservative priorities and they see a Democratic president endorsing conservative healthcare, Social Security and national security ideas. And most important, they know their continuing rule doesn’t have to involve any of the downsides of an official secession, even though a secession has already happened. 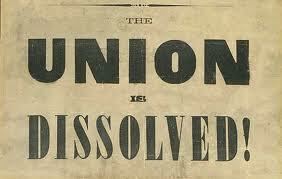 It’s the South’s dream come true — secession, but without the payback from Grant and Sherman. Footnote: I bolded some of the quote-outs from Sirota’s article to remind readers that the yahoos couldn’t have successfully engineered a virtual secession if Obama hadn’t repeatedly caved to Republican demands over the past couple of years. In fact he often agreed with the yahoos, up to a point. Otherwise there wouldn’t have been a Budget Control Act of 2011 and the sequester that followed. One more: Neo-secessionism isn’t confined to the South, of course. It’s also strong in parts of the Midwest and in places like rural Pennsylvania. But don’t kid yourselves — in their hearts, these yahoos are all waving the Confederate flag. This entry was posted in health care, history, Obama, voter suppression and tagged David Sirota, filibuster, Garry Wills, gerrymander, New Deal, Obamacare, secession, virtual secession. Bookmark the permalink.